Living from the Heart introduces an innovative, Sufi-based meditation method for improving daily life. Through becoming mindful of the heartbeat readers will be able to create a deep state of stillness and alertness, improve physical health, enhance intuition, and concentrate personal power. Bair illustrates the effectiveness of his program with stories of clients he has helped and with ancient teaching stories from the Sufi masters. 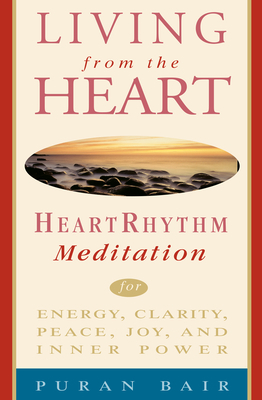 Heart Rhythm Meditation is suitable for beginners as well as experienced meditators looking to expand their practice. Puran Bair co-founded the Institute for Applied Meditation and has taught mediation seminars worldwide. He is the author of Living from the Heart: Heart Rhythm Meditation for Energy, Clarity, Peace, Joy, Inner Power, as well as the coauthor of Energize Your Heart in Four Dimensions and Follow Your Heart: The Map to Illumination.